Now, let's discuss what you'll be wearing to your evening event. We'll list the items real quick to give you the rundown, and then we'll discuss them in detail and show some products that would make the cut for your white tie affair. Let's review in-depth what we're going to wear, and what to look for in each item. Your tailcoat differs from a standard tuxedo jacket in that it always comes in a double breasted cut that is designed not to be fastened closed. That is, you always leave your tailcoat open, exposing your shirt and cummerbund or waistcoat. A good white-tie tailcoat jacket should also keep very close to your torso for a nice fit. And of course, there is the namesake feature: the coat tails, which typically extend below the waistline to cover a portion of your rear trousers. Black trousers that match your tailcoat are a must. Remember, not all shades of black are the same, so be sure you get a matching pair of pants to go with the tailcoat you choose. Tailcoat trousers typically feature a satin stripe or satin bead stripe running down the outer pant legs. 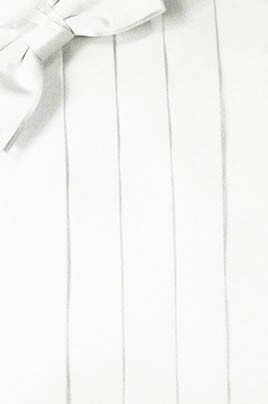 Finally, your white tie trousers will typically be worn with white suspenders (see further below for more details). When browsing tailcoats in our online catalog or the tuxedo builder, our system will offer pant options that work with your tailcoat, so you won't have to worry too much about your pant selection, we'll only suggest stuff that looks right. 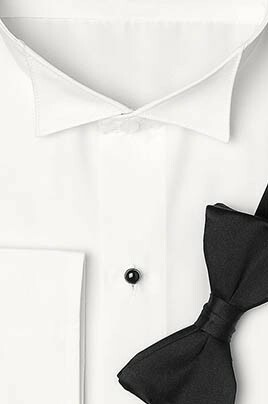 A white tuxedo shirt is an absolute must, and there are a few key features you must look for in a tuxedo shirt for white tie. As has already been mentioned, the shirt can only be white in color. Next, you don't want a shirt with buttons, we're dealing with an ultra-formal occasion, so you'll be fastening your shirt and sleeve cuffs with a formal studs and cufflinks set (more on that below). The final required consideration is the shirt collar - you absolutely must go with a wing-tip collar to pair well with your bow tie. You can opt to wear a pleated tuxedo shirt if you like, but most opt with a flat front as a white tie ensemble already has so much going on already, pleats may be pushing it. A white bow tie is required, no other color is really acceptable at a true white-tie event. Some events may relax it, but you're safest sticking with white. You can go with a self-tie option and we recommend that you do, but a pre-tied white bowtie will work just fine if you're not sure how to tie a bowtie, or do not wish to learn. You can go with a subtle print, but please go for luxury. Our solid satin, tapestry, and venetian white bowties are common favorites for white tie. Your cummerbund should be white in color and in most cases should match the print of your bow tie, if any. The cummerbund should be worn horizontally across the front of the lower belly/upper-waist with the pleat folds facing up. Your cummerbund should slightly overlap the belt-line of your trousers with the majority covering your shirt's lower belly area. Glossy formal shoes are required for white tie dress-code. You want that glossy formal look. There are matte formal shoes out there but they won't work for white tie, matte shoes pass for dress shoes sometimes, and that's just unacceptable for an ultra-formal full-dress white tie event. You want to glow, and glossy formal shoes help to nail that down. You should wear a white pocket square in your left breast pocket, it adds a flair of luxury to your ensemble and overall just brings more the table. If you go with a pocket square, it should match your bowtie and cummerbund - that means white, in the same print or pattern. A pair of white suspenders looks great with the white cummerbund, and really just adds something extra to the look. We stop just short of saying these are required, but we do otherwise strongly urge that you include a set of white formal suspenders with your white tie tuxedo. Now things are getting interesting, yes - a black top hat is totally acceptable for a white tie event. It's definitely not required but its absolutely accepted. If you want to go full-on ultra-formal, nothing is stopping you from upping the ante with a luxurious top hat. If you are already wearing a top hat and carrying a cane, we would say the scarf is now required. Otherwise, the scarf is optional but is absolutely suitable an acceptable for white tie. Less and less common, but still acceptable are white formal gloves, which can be purchased from our store. All white tie rental tuxedo packages below include everything you need, including shoes.